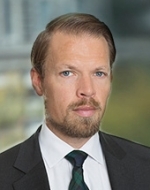 Joakim Falkner is a member of Baker McKenzie’s Securities Practice Group in Stockholm. He is listed as a leading lawyer for capital markets in Chambers Europe and IFLR1000 and is recognized by several other legal directories. Prior to joining Baker McKenzie, he worked at another global law firm. In 2008, he was appointed national representative of Sweden by the International Bar Association’s Young Lawyers Committee. Mr. Falkner is qualified to practice in Sweden, England and Wales and has a US LLM from Boston, United States of America. Mr. Falkner practices mainly in the fields of capital markets, mergers and acquisitions, corporate law and corporate governance. He represents clients in a wide range of transactions, including debt and equity capital markets transactions as well as public mergers and acquisitions. Mr. Falkner has advised clients in securities transactions under Swedish, US and English law. It requires lawyers who collaborate unusually well across borders, markets and industries around the globe. Lawyers who embrace new ideas and emerging technologies to give businesses confidence in these uncertain times.